Monday, August 13, 2018 - By Friday of last week, the Turkish Lira had taken the center show pushing aside interest rate, trade war and inflation concerns. 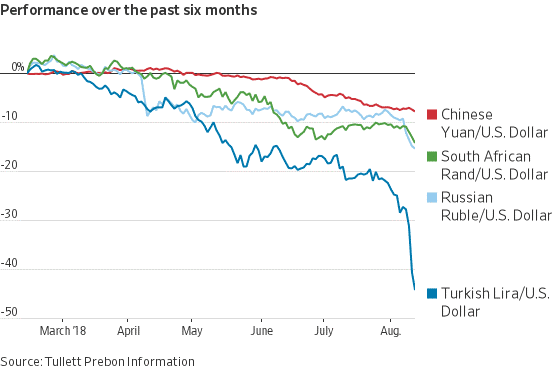 The lira’s plummet led to a mild sell off across global equity markets. While policymakers talked down the significance of the effect of the lira crash, the situation worsened when the POTUS announced significant tariffs on imports of Turkish Steel and Aluminum. The European Central Bank met over the weekend to assess French, Italian and Spanish bank exposure to Turkish loans. 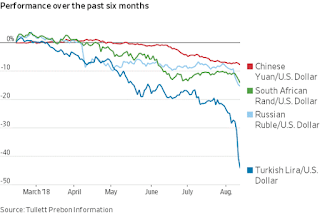 The crash has continued into this morning with other emerging market currencies being dragged down. The lira is down over 44% year to date. Other countries running current account deficits are under pressure as well. This is what a currency crash looks like thanks to our friends at Dow Jones. August 2018 Turkish Lira plummets 23% in one week. We hope our readers brought a fully charged cell phone to the beach this weekend. US indexes ended last week flat for the S&P 500 and the NASDAQ Composite with the indexes closing at 2,833.28 and 7,839.11 respectively for a weekly move of minus .25% and plus .35%. A brief tour around the globe would raise some orange flags and red flags for some emerging market investors. The usual concerns of rising US interest rates, inflation and increasing trade tensions were eclipsed by the rising US Dollar and the increasing pressure on select emerging markets and Italian bonds. Countries running large current account deficits particularly Brazil, India, Indonesia, Turkey and South Africa may offer trading opportunities via various Country Funds which can be found in the ETF Global Screener. Expect Investor money to flee these markets for the safety of US money markets. Domestic Politics and International Relations will determine how far the Turkish crisis goes. Endogan needs to continue domestic expansionary policies to keep his base. This will lead him to mend relations with the US and Europe in return for a bailout or pursue a new alliance with either China and/or Russia or face a severe domestic economic shock of crushing interest rate increases and capital controls. For those who want to play the news, TUR, the iShares MSCI Turkey ETF would be a good trading vehicle. To play a scenario of a continued strong US Dollar – let us not forget Brexit is looking increasingly like a rough landing and any banking crisis resulting from Italian debt pressures or Turkish defaults, investors may want to use FXB, the Invesco British Pound Currency Shares ETF. Forgotten in this week’s headlines was the 10 year anniversary of the Russo -Georgian War which many believe marked the end of the Post-Cold War Era and set the stage for the breakdown of the global regime of that era. We will look at the significance of this for investors next week. We suggest a mindful eye on tools like our Select List and Risk and Reward Ratings that can be used to evaluate the vast set of opportunities in the ETF marketplace. Today’s market realities require a new approach to macro investing, one in which individual investors now have access to tools via ETPs to customize risk and return profiles in their portfolios. Use our Scanner to find those funds.